Nothing says "fortitude" like sticking-it-out against all odds thrown at you. Mighty US Presidents have faced countless attacks but made it to the end of their term. Reagan. Bush Sr. Clinton. Bush Jr. Obama. Three Peaks. One Day. All Guts. All Glory. It's been a good year since Alhambra Valley Rd (Pinole) has washed-out so we would HOPE that CalTrans has their act together by the end of this summer. We'll see. Stay tuned closer to event time as we'll be sending-out an emissary to test-out the roads once more, not just for AV Rd neither. 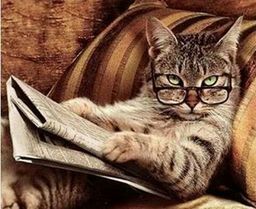 We heard your complaints/concerns going through Mill Valley, so we're gonna review out the old route through Fairfax, to see how things are. Start in San Jose early Saturday morning. 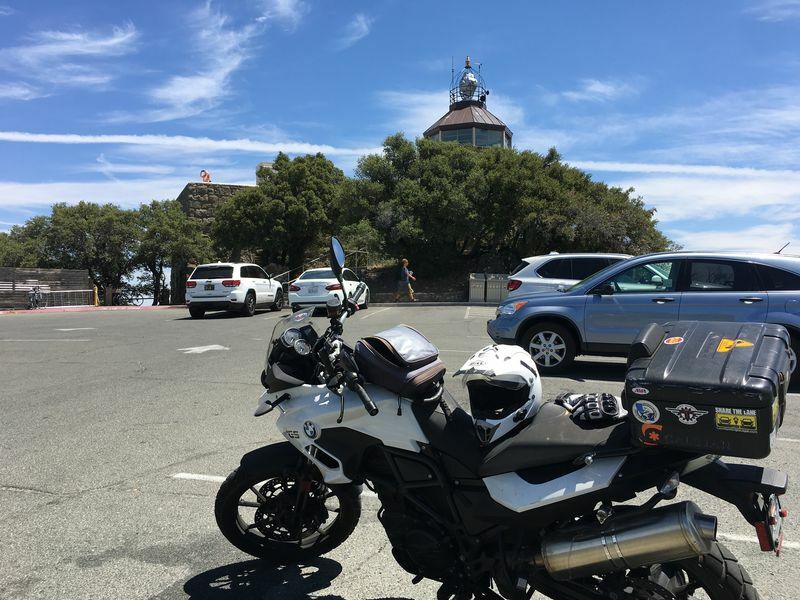 Ride up to Mt Hamilton, to Diablo, out to Tamalpais. This is not a race, but you do have to keep moving to complete the challenge before nightfall. We will pause to regroup from time to time, but each rider should be prepared to navigate the course without aid from others. As always, we will start in San Jose and finish atop Mount Tamalpais. Be prepared for a VERY early morning meet-up, and to depart 1hr later. As tradition goes, we will break for lunch between 12p and 2p, at Genova Delicatessen & Ravioli in Walnut Creek (S. California Blvd. & Olympic Blvd.). 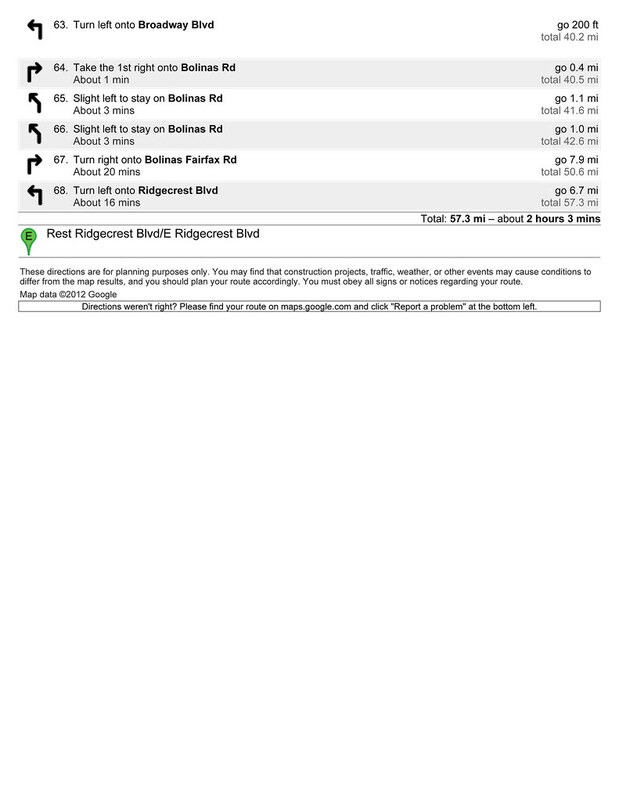 Route information will be available for those who feel they may lag and/or fall behind, both in print form and online. There will *NOT* be a support truck for this ride, so you will more-or-less be on your own should you encounter issues or a breakdown (mechanical or otherwise). We expect this to be an all-day event. Riders will be of all experience levels, so some will push their machines and themselves harder than others. This does not mean you are expected to "keep-up". Just make sure you finish if you can. They will be available for $10 at the finish. We are having year rocker patches to surround the patch for each year you complete the challenge. We will get your info and send you the rocker for 2018. For 2017 and other past years, we should have these available by then as well. 1) If we've said it already, we'll say it again - THIS IS NOT A RACE! Each individual is to ride at his/her own pace, and just get to the checkpoints when you can. We will be printing X amount of directions so you may need to pair-up with others if you don't know the route. 2) It helps to have cash readily available to you when you do this ride. It’s $10 to get into Mount Diablo State Park, but that $10 charge will also allow you access to Mount Tamalpais (if the Rangers ever enforce the entry fee). There is a toll when crossing the 580 Richmond-San Rafael Bridge. 3) Golden Gate NO LONGER has Toll Takers so you have to either pay ahead, use your FasTRAK (if you have one), or get billed in the mail later (possibly with HIGHER fees tacked-on). We recommend going to http://www.goldengate.org/tolls/helpmechoose.php and see what option works best for you. 4) If you feel you've had enough of the challenge before completing the ride, no hard feelings. Just pull someone over for directions to the nearest freeway and you can ride home on your own accord. 5) There are no winners or losers in the Three Peaks Challenge - only those who can finish a very tough ride. These are backroads we'll be taking, where riders on 50cc have made it through the entire thing - though they didn't get to rest as frequently as the rest, they toughed it out. 6) Be prepared for rapidly changing weather. 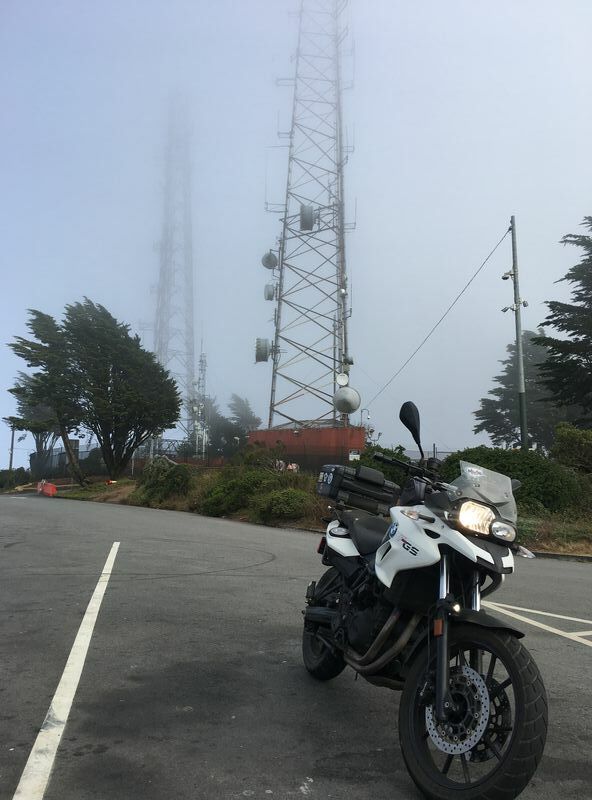 Often we start with an overcast morning, are roasting by the time we get to Diablo/Walnut Creek, and then encounter wet roads and drizzle around Mount Tam. This has got to be one of the more odd-ball rides for weather, from start to finish. 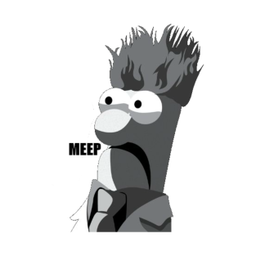 7) Don't try to be a hero and ride with the faster riders if you can't handle sharp turns at high speeds. Ride according to your own style, and traffic rules. Some of us are crazier/more stupid than others when we ride; others just call it experience. These are JPEG versions of the printed map available on Flickr for the FIRST THREE-QUARTERS (Zamora's to Genova Deli). 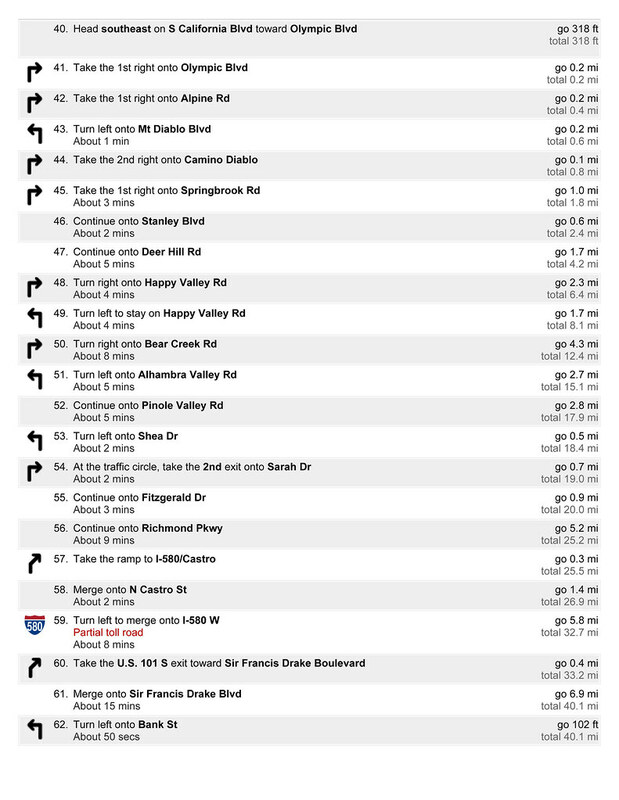 The last section has experienced issues with road washout (Pinole) and construction closures (Bolinas-Fairfax) so BE AWARE OF YOUR SURROUNDINGS!!! * RIGHT ON RIDGECREST BLVD. Some say scooters aren't meant for long/hard rides. I say it's the rider that matters, your ride is your tool/weapon. Nobody ever called us Snowflakes - just crazy. SERIOUSLY : it's NOT a race, your bike needs to be in proper running form, and Rolf always wanted for "everyone to have a good time." We'll see you at Zamora's for breakfast! Follow us on Twitter and Instagram for updates as they happen. Hoping to join in again this year and raise a glass to Rolf after everyone arrives safely at the top of Mt Tam. VCLG Member Jesse (yours truly) made a run on the 3 Peaks Challenge route yesterday as a recon mission, with a bonus 3 Peaks to successfully complete the SIX Peaks Challenge; Umunhum, Hamilton, Diablo, Tamalpais, & Twin Peaks. 12 hours Door-To-Door from his home in San Jose (~280 miles). 11 hours in the saddle. 10 hours from the first Top-Off to Twin Peaks finish. * Camden Ave off Hwy 85 will be your best exit for closest drop-off if you are looking to start with Mt Umunhum. * Best top-off is the Arco on Camden (Cash/Debit only) before you take Hicks Rd up towards Umunhum. * It's a 15min ride from Arco to the Umunhum Gates so best KSU is 645A if you want to get there just as the park opens at 7A. * It will take you 1hr from Umunhum Gates to Zamora's Omlette House if you take Hwy 85/Hwy 87/Hwy 280/Hwy 680, allowing you to start Hamilton just as the larger peloton/group/participants depart breakfast. * There is one section of stoplight construction on the backend of Hamilton, going over the Isabel creek. 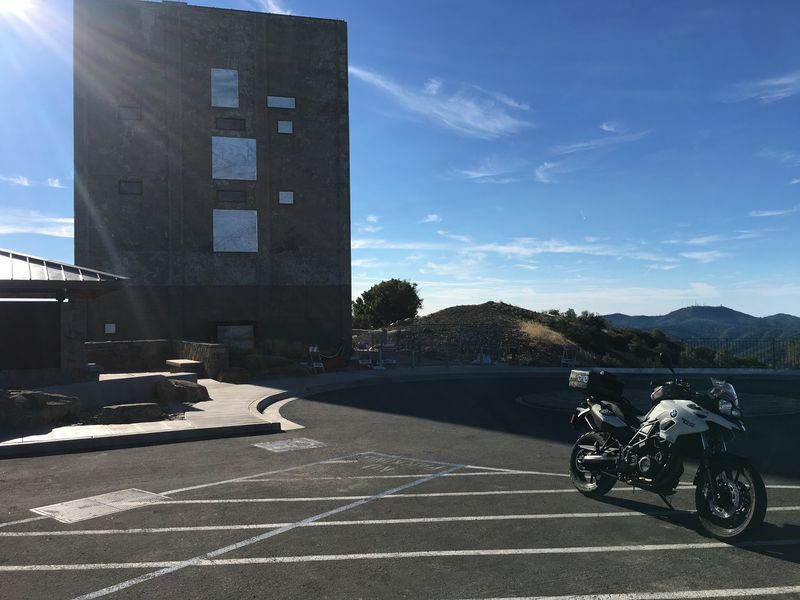 * If you are running Umunhum, another top-off IS recommended along Alum Rock for bikes with <2 Gallon capacity to avoid running on fumes into Livermore. *Having exact change into Mt Diablo ($10 Cash) is recommended. *No report on backroads between Walnut Creek to Richmond-San Rafael Bridge. * Bridge Toll is $5 Cash to cross the Richmond-San Rafael bridge (unless you have FasTrak). * Sir Francis Drake is clearest shot to the backside of Tamalpais (Left on Claus Dr, Left on Broadway, Right on Bolinas Rd - look for Fairfax Coffee Roastery). * Repaving is still active on Fairfax-Bolinas Rd going in towards Alpine Lake, so be aware for construction Stop Areas. * And YES the temperature/weather changes were INSANE going from one peak to another. BRING WATER AND LAYERS!!! We'll print a handful of turn-by-turn maps for those who are unfamiliar with the route, but the original GPS Files are still valid. We'll see you at breakfast, August 4th at 7AM! A "Well done" to Jess. I'll be breakfasting at Zamora's, should be there by 07:00. Can't make it this year but have hopes for next year! Ride safe kiddos and post pics please!!! We are a week and a day away from our next throwdown of the #ThreePeaksChallenge, next Saturday. Remember - there are two challenges available to those willing to run the gauntlet : the traditional Three Peaks Challenge that meets at Zamoras Omelette House at 7AM; the Six Peaks Challenge with a KSU of 645a from the ARCO Gas Station on Camden Ave. The latter is for those TRULY willing to sacrifice the hours in-the-saddle and do something different. For those running the Six Peaks, we need a Selfie or Scooter Shot of your ride atop each peak, with the defining landmarks in the background (full credit for the additional mileage shot from ARCO & Twin Peaks. We won’t have the traditional Patch/Rockets available this year, but will be handing-out Vinyl Decals for each challenge completed (either one or the other per-person; 6PC Participants, we ALREADY know you completed the Original Three). You guys wanted more info, thus I provide. Above is the most “traditional” straight/easiest route you can take, PERIOD. Livermore has gone through growing changes over the years, but N Livermore and Collier Canyon both end-up at Highland / Camino Tassajara into Danville. 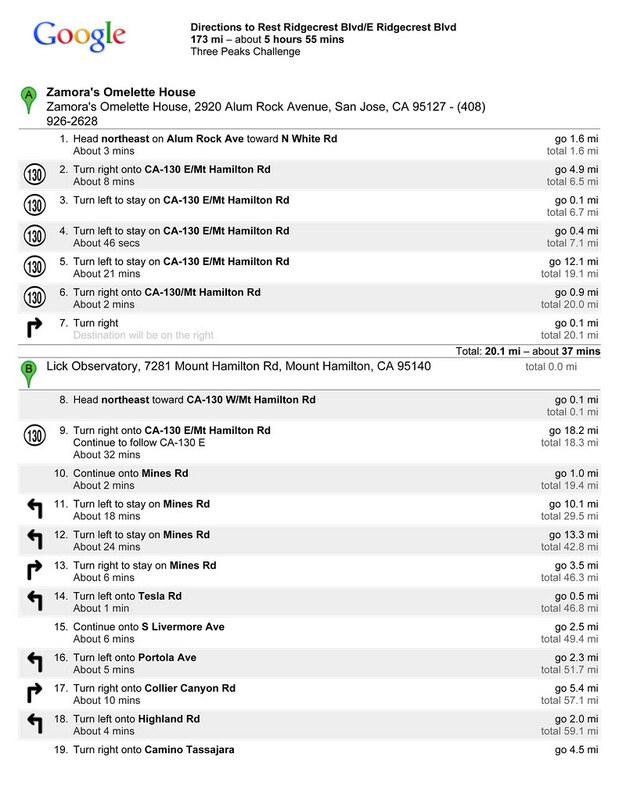 I will have 20 maps printed for the traditional 3 Peaks Challenge, so if you’re doing the extra Six Peaks Challenge, you need to figure-out the route from Umunhum to Hamilton and from Tamalpais to Twin Peaks on your own (not that hard really). 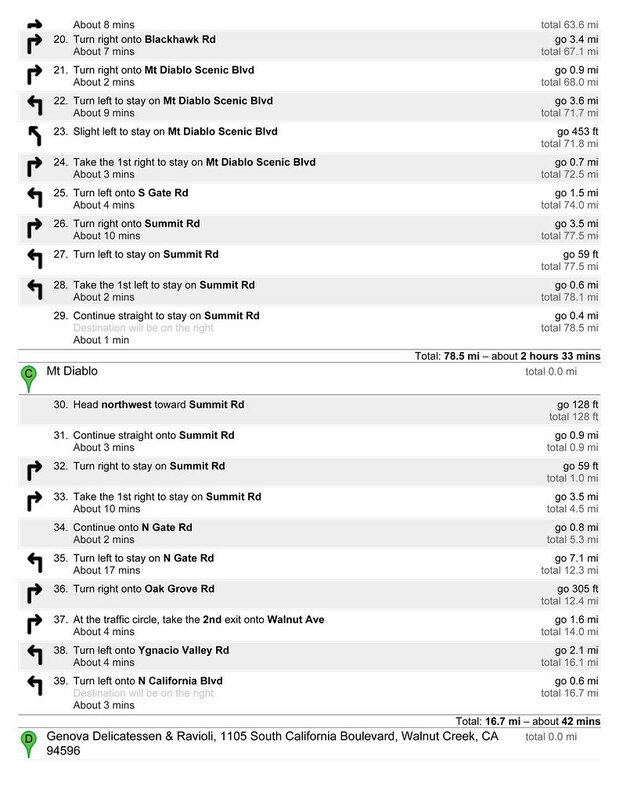 Also note that the printed routes will reflect one of the older versions (see link for “1 of 4” below), when Livermore was under construction, as S Livermore now leads to N Livermore > Manning Rd > Highland Rd. 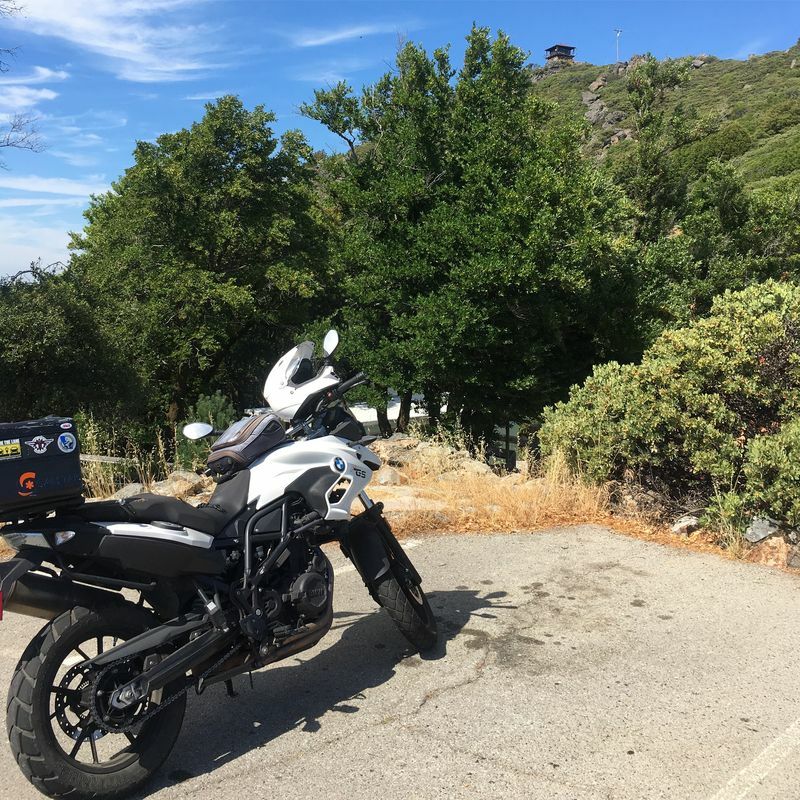 Selfie / Scooter Shot with background at every peak (Credit for Lower Parking Lot at Umunhum). Recommended top-off before you ascend Mt. Hamilton for scooters with <2 gallon tanks. We’re confirmed for 15-20 ppl, so expect to pay a little extra on your meal because there’s SO many of us who flood this small establishment at once. Tip your waitress - this place is worth it. $10 Entrance Fee (CASH) for Mt. Diablo - will allow you entrance/parking at Tamalpais, if they ever enforce it). $5 Bridge Toll (Cash unless you have a FasTrak transponder) for Richmond-San Rafael Bridge. 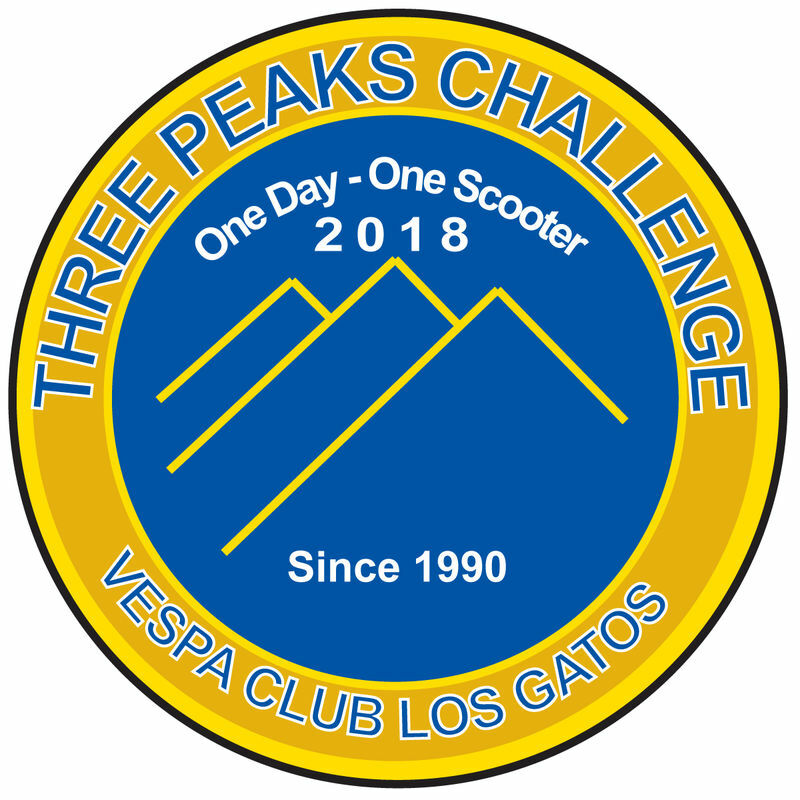 A VCLG Member will be on-hand to doll-out Three Peak Challenge Decals to this who have successfully completed all three mountains. $8 Prepaid Bridge Toll for Golden Gate (http://www.goldengate.org/tolls/helpmechoose.php) unless you have FasTrak (then $1 off). 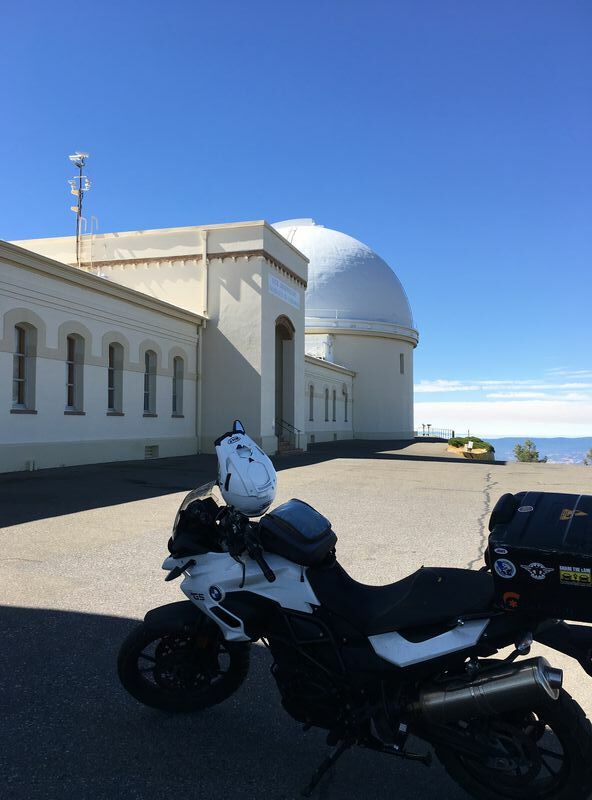 Final Mileage and Summit Selfie/Scooter Shot. 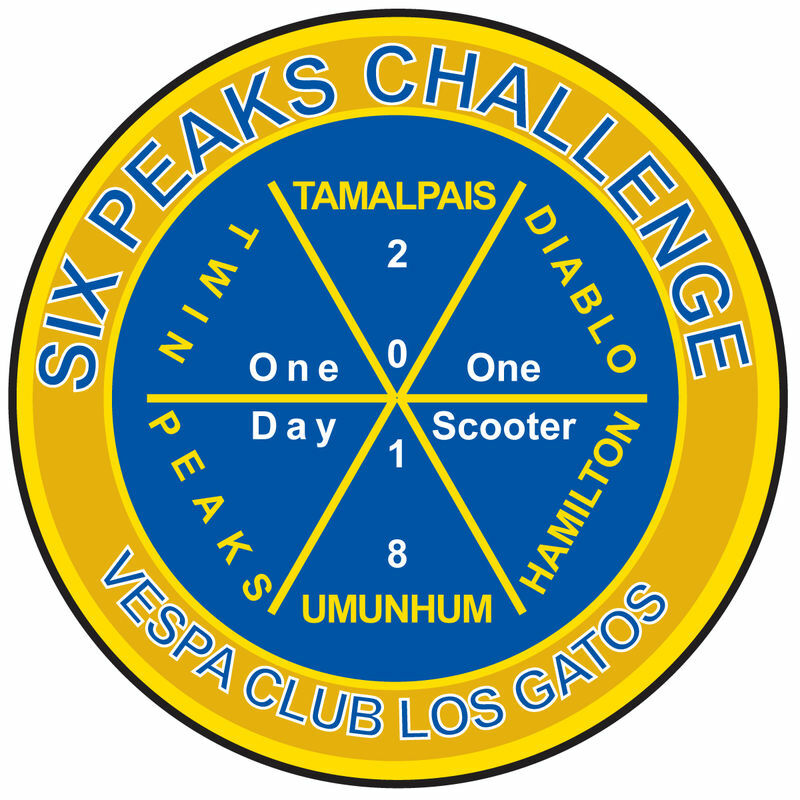 A VCLG Member should be atop Twin Peaks to confirm all your shots/mileage, presenting you with the first Six Peaks Challenge decal. * IT’S NOT A RACE! Ride within your own limits. * This is NOT a Group Ride - every rider for themselves. * No support truck will be available. * Recommended to have exact Cash readily available for Diablo Entrance/R-SR Bridge. * Prepaying will help you for crossing the Golden Gate. * Weather changes QUICKLY - be ready. * Bring water and rehydrate often (Gatorade, Powerade, SmartWater are recommended if you sweat profusely, to replenish electrolytes). * ALWAYS obey the Rules Of The Road - adjust your speed accordingly for changing road conditions. * No “Winners” or “Losers” here - just people who can accomplish the ride many can’t/won’t try. For those of you participating in tomorrow’s Three Peaks and Six Peaks Challenges, we’re looking forward to seeing you out there. VCLG Member Brian will be running with the Six Peaks Challenge crew, so look to him for your decal at the finish. 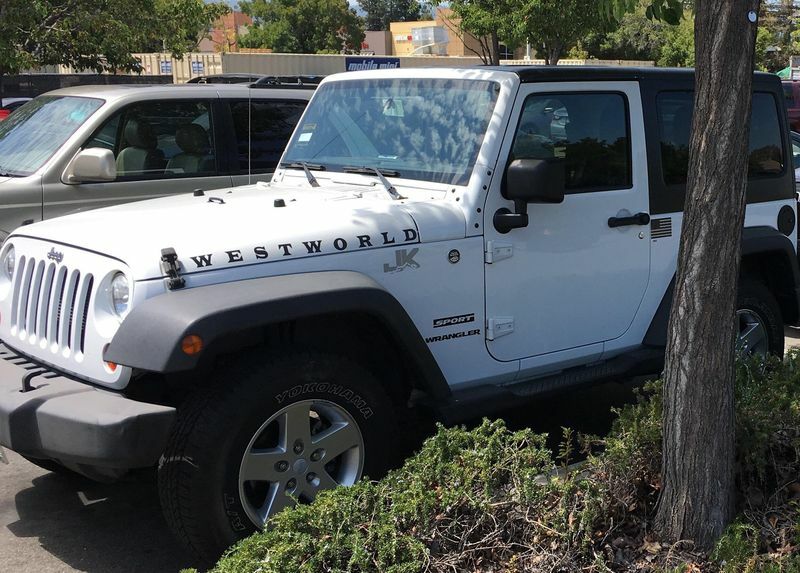 For those only doing Three Peaks Challenge, look for me (Jesse) in a White Jeep Wrangler (pictured) to get your decal. I’m only staying-up there as late as 4p so if you miss me, send us a picture here of your scooter atop Tam (with a notable landmark visible) and we’ll find a way to get it to you. As for the maps, I’ll find a way to get them to Zamora’s before breakfast. Only seven turned up at Zamoras - and only six more made some of the ride. Perhaps this has become too big a challenge for the younger generation?